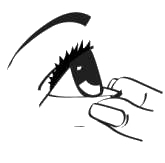 With your thumb and index finger, gently pull the lower eyelid to form a small pouch. Looking upward, apply ONE (1) DROP in your eye. Try not to blink. 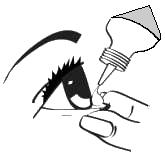 Do not let the applicator tip touch the eye or eyelid, since this could contaminate the eyedrops. 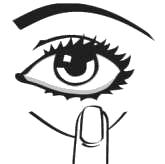 Keeping your eye closed, gently press the inner corner of your eye (near the nose), for 1 minute. Doing this will ensure that the medication stays in contact with your eye longer, and thus is more effective. If you have to apply more drops, wait a few minutes between each instillation. Do not keep opened bottles of eyedrops for long periods of time and do not rely on the manufacturer's expiration date on the container; the date is valid only if the container has not been opened. Always check with your pharmacist to know how long your drops are good for.